There's not much news and it's a silly pre-holiday trading day so I'm going to reveiw the OOP instead. The Options Opportunity Portfolio was initiated last year in Seeking Alpha's Marketplace and, since the Summer, it's been on quite a tear and we just crossed $300,000 – up 200.7% from our $100,000 initial set-up back on Jan 3rd of 2018. You can follow our progress and changes under the Virtual Porfolio Tab on Philstockworld's main page and, unlike our Long-Term/Short-Term paird portfolios, the Options Opportunity Portfolio is self-hedged – so it's just the one, balanced portfolio. Our goal in the OOP is to take advantage of OPPORTUNITIES in the maket – usually we jump on stocks that have been unfairly sold off on news we don't consider as bad as the traders who are running out of the stock. That's why you see a lot of stocks in here with erratic charts – usually they've had some kind of mishap which drew our attention to them. 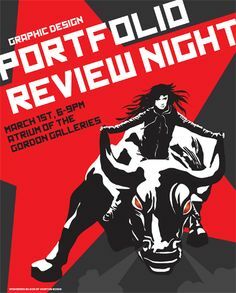 In our March Review, on the 7th, we were at $283,465 and now $300,689 is up $17,224 for the month and that's 17.2% of our original $100,000 – so pretty good for a month – too good really and we're going to look carefully for places we can take some money off the table, as we don't REALLY trust this rally. FTR – This has been a bad trade for us this year and we're just waiting to see what happens on 4/30 earnings. HOV – This one we're expecting to recover nicely over time. TZA – One of our hedges, no adjustments. TZA is a 3x Ultra-Short so a 20% drop in the Russell should give us a 60% bounce to about $14.50, which would make the 50 calls worth $6.50 so $32,500 less the current value of $10,275 means we have $22,225 worth of protection here. LB – An aggressive put but we like LB. PLAY – Not worried about these. 8,000 on the Nasdaq Composite! 5,150 was the top in 2,000 before the great crash took it back to 1,200, a 76% drop which took many years to recover from. In fact, we only got back to 5,000 in 2016 but here we are, less than 3 years later, up another 3,000 (60%) and no, I don't think this time is like 1999 when people were throwing money at terrible stocks but there are still plenty of stocks people are throwing unrealistic amounts of money at and there WILL be a reckoning – one day. We did consolidate for about a year at the 5,000 line, which means roughly half the people trading thought stocks should be higher and half thought they should be lower but then Trump got elected and promises were made (not kept, just made) and we've been off to the races ever since. 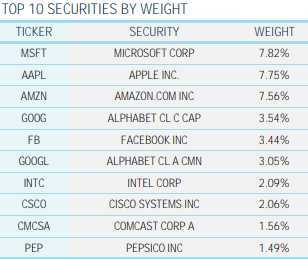 If we want to determine whether 8,000 is too much for the Composite, we should look at the top 10 holdings, which make up a whopping 40% of the indexes weight while the other 2,629 components fight for the other 60%. The simple question we can ask here is are these companies worth 60% more than they were in 2016 and, to do that, we can simply look at earnings and revenues because we should expect some real changes, right? While Apple (AAPL) gets a lot of attention as it nears $1Tn in valuation, Microsoft (MSFT) has quietely gotten there without the drama and is "worth" $927Bn at $120. Revenues have gone from $92Bn to $118Bn (up 28%) while profits in 2016 were $20.5Bn and, last year, they were $16.5Bn but that was due to write-offs and they should do better than $34Bn in 2019 and that's up 70% so yes, MSFT is worth much more than in 2016 but I'm not sure I want to pay $1,000Bn for "just" $34Bn in earnings (p/e 29.5) so I would give this one a B- grade. 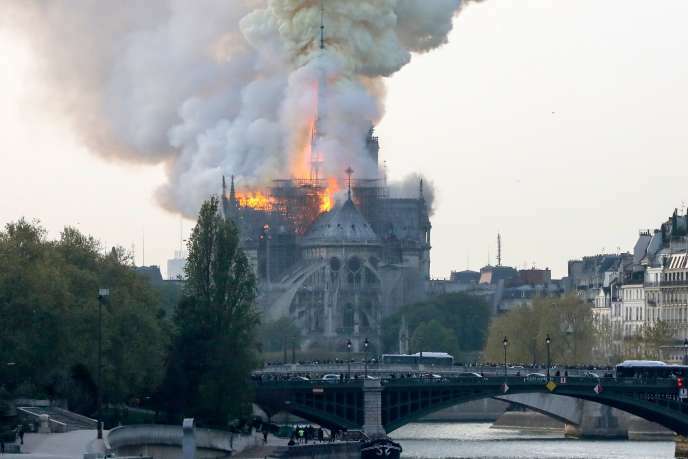 All eyes were on France yesterday as Notre Dame had a tragic fire, destroying a large part of one of the World's greatest architectural wonders. Victor Hugo said Notre Dame is a work of art authored by humanity itself, with no individual artist. It surpasses anything an individual can do and therefore becomes the best of what all of us can do – it's loss is a great tragedy and already hundreds of Millions of Dollars have been pledged to rebuild it. When Hugo Wrote "The Hunchback of Notre Dame" the church had already been destroyed during the French revolution and his novel called enough attention to it that it underwent a great rebuilding program in the mid-1800s so, almost 200 years later – we're just repeating the cycle – hopefully with less wood this time! In truth, there's not all that much left of the original, built in 1163. 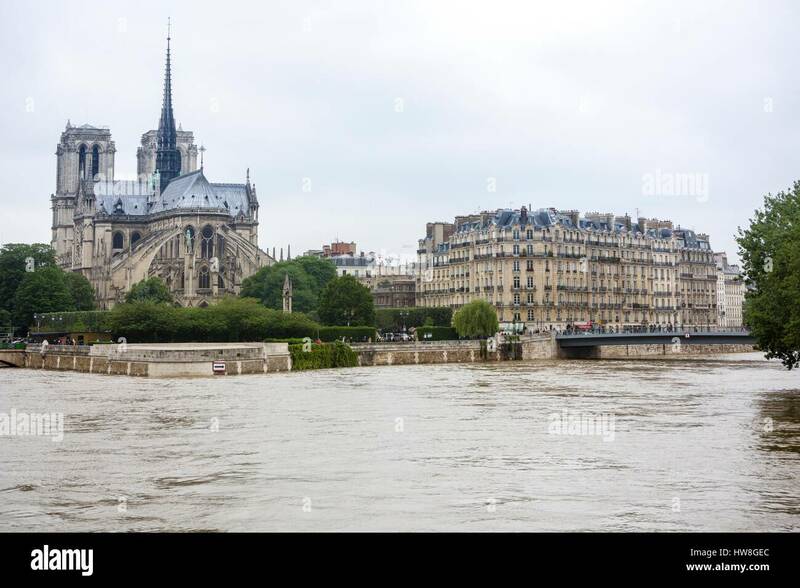 So, while we may see it rebuilt and think "it's not the same" – our great, great, great grandchildren will probably see it as an achitechtural classic once again – providing we do something about Global Warming, which came within 3 feet of breaking over the embankments during the 2016 Paris Flood. Finally we get to see whether or not these record highs come with record earnings! 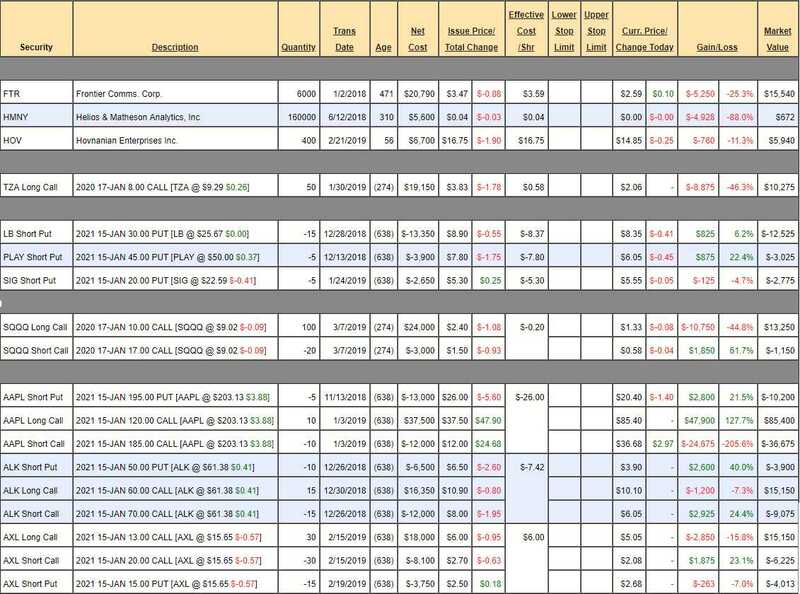 We got off to a bang on Friday with beats from FRC ($1.26 vs $1.22 expected), INFY ($9.36 vs $8.95), JPM ($2.65 vs $2.35), PNC ($2.61 vs $2.60) and WFC ($1.20 vs $1.10) so so far, so good it seems and, this morning, Citigroup (C) came in at $1.87 vs $1.79 expected and Goldman Sachs (GS) is $5.71 vs $5.02, M&T Bank (MTB) $3.35 vs $3.29 and we're waiting for Schwab (SCHW) and Washington Federal (WAFD) but things are looking good in banking. Goldman Sachs, of course, gained 2.5% on Friday so today's earnings is giving them no additional lift and that's another sign of a toppy market as the whole banking sector went up on just a few earnings reports so woe unto any of them who fail to deliver going forward. We still have plenty of Banks to hear from but, more interesting, will be the companies who may have been affected by the Government Shut-Down in Q1 – that's where we're expecting to get some resistance. Earnings Whispers has the above cool charts for earnings and I love the "implied move" into earnings as it can alert you to seriously mis-matches that we can potentially take advantage of like Micro-Vision, where options imply a 50% move but the average move is only 11.3%. MVIS is essentially a penny stock, trading at $1.03 but it does have options abd a fun way to play them is to sell the August $1 calls for 0.40 and sell the August $1 puts for 0.30 so you are collecting 0.70 and anything less than an 0.70 move between now and Aug 16th (expiration day) is your profit. http://welcome.philstockworld.com/wp-content/uploads/2015/09/PSW-Adooma-logo.png 0 0 Phil http://welcome.philstockworld.com/wp-content/uploads/2015/09/PSW-Adooma-logo.png Phil2019-04-15 12:33:102019-04-15 12:33:10Monday Market Movement – Earnings Season Finally Begins! At 4am the week turned positive in the Futures. A bit later, it was announced that Chevron (CVX) was buying Anadarko (APC) for $33Bn AND CVX will spend another $5Bn buying back 2% of their own stock. That's pumping up the energy sector into earnings season as APC is getting a 44% premium to yesterday's close, which is an indicator that the energy sector stocks may be underpriced by quite a bit or it's simply a play to capture Natural Gas assets (/NG), which we are long on. Wheeee – that was fun! Yesterday, in our Live Trading Webinar, we picked up two shorts on Gasoline Futures (/RB) after reading the Full Petroleum Status Report (released at 1pm) and deciding the run-up to $2.06 was miguided. We rode out a bit of pain to $2.07 but decided to stick with it into the close and, this morning, we were rewarded with a lovely drop to $2.04, where we are taking the very nice $2,196.60 profit and running. Congratulations to all who played along at home. Once again, this is the key to Fundamental Investing, we read the news and reports, check out the data and then make our trades based on how that information is likely to affect the stocks and commodities we are trading. It's much more fun, and satisfying, than starting at squiggly lines on a chart all day. This morning there's pressure on commodities and indexes as well, with Silver (/SI) plunging all the way back to $15 and Gold (/YG) to $1,300 as the Dollar pops back up – something else we were expecting and today's excuse is a Brexit extension that has weakened the Euro and the Pound but also the relatively hawkishness of our Fed compared to other Central Banksters is a factor that continues to keep the Dollar strong. We love playing /SI long at the $15 line, it's great for a bounce and an easy line to place tight stops below – especially when the only reason Silver is down is because the Dollar is up – that's a dumb reason for people to bail out of their positions but /SI is a painful contract, at $50 per penny, per contract so gains, and losses, come very quickly. $14.90 has been the low for the year and the $15 line has held up well so we take these opportunities whenever they come along. Are we recovering from yesterday's dip? 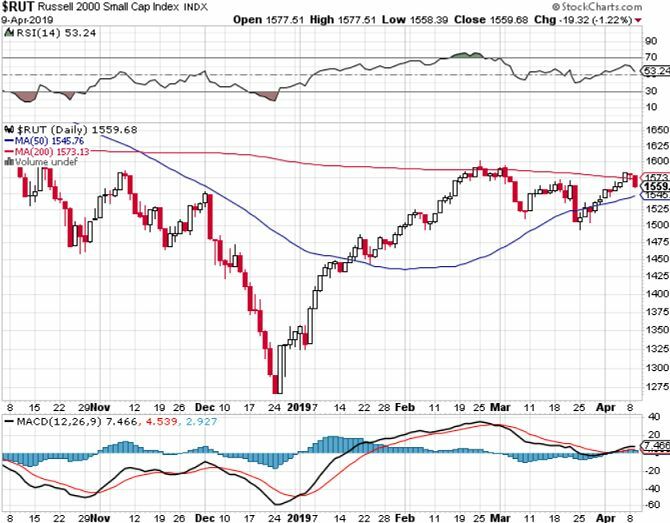 While the Futures are up 0.2%, the Dollar is down 0.2% so that's just a re-pricing against the weak Dollar, rather than a pre-market rally and, even with the currency boost, the Russell (RUT) has once again failed to hold the 200-day moving average at 1,573 and that's what signaled our March sell-off but it won't be a catastrophe until we fail the 50-day moving average at 1,545 – so that's the line we want to watch very closely. Yesterday we shorted the S&P Futures (/ES) with a target of 1,580 and we hit that on the nose for a $1,000 per contract gain and then we flipped to the Nasdaq (/NQ) shorts at 7,600 and those paid us another $400 per contract into the close but this morning we're just watching and waiting – mostly hoping oil pops to $65 on inventories (10:30), so we can short that. Oil is up from the $59-60 range in late March so call it $59.50 and 10% up from there is actually $65.45 but let's say $65.50 and it's a $10 run so $2 pullbacks to $63.50 (weak) and $61.50 (strong) but I'm betting weak holds as we have a holiday coming up. In either case, we can prettty confidently take a poke at shorting oil at $65 with a tight stop over (0.10) and then again at $65.50 and $66 if we have to and we'll carry our 0.20-0.30 loss knowing it's very likely that, when we get it right, we have a $2 ($2,000 per contract) gain to look forward to. Remember, I can only tell you what is likely to happen and how to make money trading it – the rest is up to you! Apparently, since the EU MIGHT have given Boeing rival Airbus $11Bn worth of subsidies since 2004, the Trump Administration will retaliate by placing tariffs on cheese, bicycles, kitchen knives, artist's brushes, etc. While this may seem crazy and illogical, it's really just another day in Trumpland, so no one is really batting an eye and, although the German and European stocks have turned down on the news, the US stocks are, as usual, ignoring the inevitable retaliation this is likely to cause. Technically, Trump isn't allowed to DECLARE tariffs whenever he wants and it's kind of hard to see how cheese is a national security risk but that ship has already sailed with the Chinese tariffs (which are also not going away) but what's the point of even pretending we follow the rules anymore? 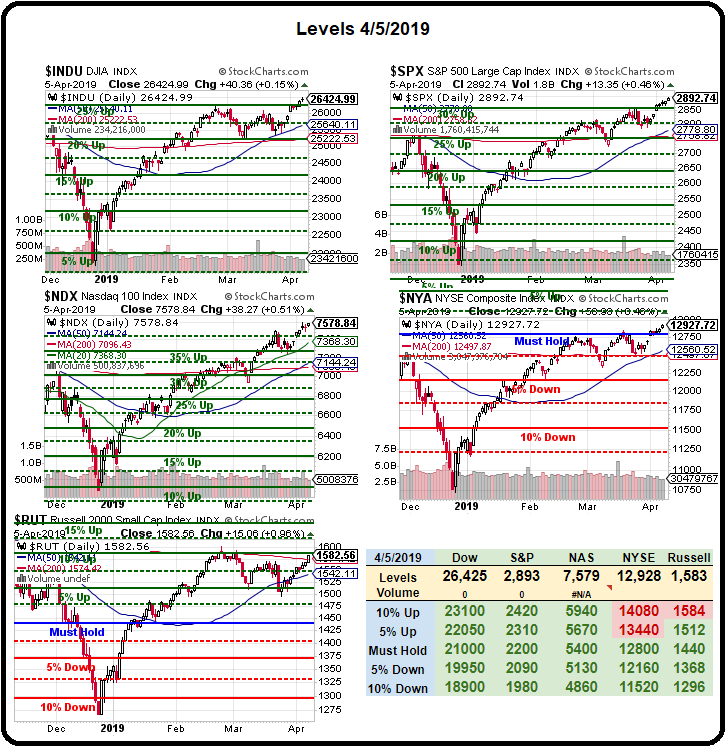 We're testing another major level at S&P (/ES) 2,900 this morning but, as noted in yesterday's PSW Report, we shorted it into yesterday's close anitipating that SOMETHING would cause us to pull back after testing that level. So far, we're up $250 per contract so we can set a stop at $200 and lock in the gain and raise the stop $50 for each $75 we gain going forward. Since the S&P is up 50 points on this run, a weak retrace should be 10 points, back to 2,890 so our expectation, at $50 per point, per contract, is to make $500 per contract just following the 5% Rule™ – isn't that nice and simple? If we're lucky, we get a strong pullback of 20 points to 2,880 and we'll know if we're getting a strong pullback because the weak bounce (2 points) will fail at 2,992 so our stop will the $400 gain at that line by the time we get there. See, Futures are easy! Boeing is still having trouble fixing the 737 Max planes and announced over the weekend they would be cutting production of the planes for now, which is sending their stock down $16, pre-market, which is good for about 130 Dow points and BA is also a big player on the S&P 500 so it's responsible for all of the pre-market losses (as of 7:30 am) so far. "As we continue to work through these steps, we're adjusting the 737 production system temporarily to accommodate the pause in MAX deliveries, allowing us to prioritize additional resources to focus on software certification and returning the MAX to flight," CEO Dennis Muilenburg said in a statement. "We have decided to temporarily move from a production rate of 52 airplanes per month to 42 airplanes per month starting in mid-April." Other than BA, the rest of the indexes are continuing to show strength and there's no sense fighting the tape, especially with all of our indexes now above their 200-day moving averages with 3 of the 5 majors making what are called "Golden Crosses", where the 50 dma crosses over the 200 dma – a fairly reliable bullish chart patten. That doesn't mean this isn't a good time to grab some hedges. In fact, it's the best time to hedge as the indexes are high and the Volatility Index (VIX) is low, which means your cost of insurance is low as well – since the general sentiment is that the rally will continue. In Friday Morning's PSW Report, we liked shorting the S&P 500 Futures (/ES) at 2,900 and we topped out at 2,899.50 and now we're back town to 2,895, which is still a good shorting spot as long as you keep very tight stops above. Nasdaq (/NQ) 7,600 is also going to be hard for the bulls to cross, so that's another excellent shorting line with tight stops above in the Futures. Our last Non-Farm Payroll Report really sucked. Jobs created dropped down to an anemic 20,000 in February, possibly as a result of the Government shut-down, which ended at the beginning of the month. We'll see what happens at 8:30 as 160,000 jobs are expected to be gained for March but they expected 200,000 jobs last month and Leading Economorons missed that one by 90%. Most likely we get a big rebound as 20,000 was unusually low. NFP is made up of a lot of factors so it's best not to guess. Interestingly, wages rose 0.4%, which is an almost 5% annual pace and that is running red-hot and, if we see that kind of number again – we can expect a downturn in the Futures as it's a sign the economy may be running too hot and that puts the Fed back on the table because the inflation the Fed hates the most is Wage Inflation. Wage inflation scares the Banksters who run the Fed as it squeezes Corporate Profit margins, causing them to borrow less money and, of course, banks employ many, many low-wage workers and giving money to workers can lead to inflation becuase, unlike the current plan of giving money to people who already have lots of it, when you give money to the bottom 80%, they tend to spend it and then it circulates in the economy and has a multiplier effect and then we get inflation due to an increased demand for goods and services. Why do Banksters hate inflation? Because they lend you $300,000 at 4.5% for your home and you pay them back $1,721 a month for 30 years but, if inflation is 5%, over time the bank gets less and less money back relative to inflation. For over a decade, this has gone the other way, the banks were lending at rates that were locked in higher than they rate they could borrow at (currently 1.75%) and they've been making tons of money and inflation has been non-existent - they don't want that to stop. http://welcome.philstockworld.com/wp-content/uploads/2015/09/PSW-Adooma-logo.png 0 0 Phil http://welcome.philstockworld.com/wp-content/uploads/2015/09/PSW-Adooma-logo.png Phil2019-04-05 12:31:442019-04-05 12:31:44Non-Farm Friday – Is America Working?